The 1994 World Cup final was a grand, tense affair but most of it passed me by. Only the penalty shoot-out woke me from my trance. I’d fallen in love, but not with the mischievous guile of Bebeto or Romario. It was an Italian defender who had caught my eye, and not young, wild-eyed Maldini. No, it was Franco Baresi, the captain, making possibly his final appearance for his beloved nation in the biggest game of all. And what a game he played. Even now when I watch the footage, Baresi has the look of a man approaching fifty so you can only imagine how old he looked to a six year-old me. The wispy head of hair atop the deeply furrowed, prominent brow, the grimacing, the hobbling, the hand on the lower back. This aching man the bastion to fend off a Brazilian siege? It seemed impossible. What pace he’d ever had was all but gone but it didn’t matter when you could read the game as he could. Like fine wine, the football brain matures with age; by thirty four, Baresi’s was a rare vintage. Not a single stride was wasted; he knew exactly where the ball would go and thus where he needed to be. He charged forward to intercept, he beat men to the ball. On the back foot, he blocked once and then twice, and then a third time if needed, the ball magnetically drawn to his outstretched feet. Where possible, he moved the ball with composure and grace, but then never has a man made the Row Z hoof look like such a cultured decision. His socks slumped to his ankles but Baresi fought on. Surely he had the gods on his side. But in the end, they abandoned him. At the final whistle, he sank to the ground in agony. His teammates surrounded him, doing their best to revive their fallen leader. When an ambulance cart carried him off the field, it seemed his greatest day was done. But the best stories never end there; heroicism is relentless in its pursuit of glory. 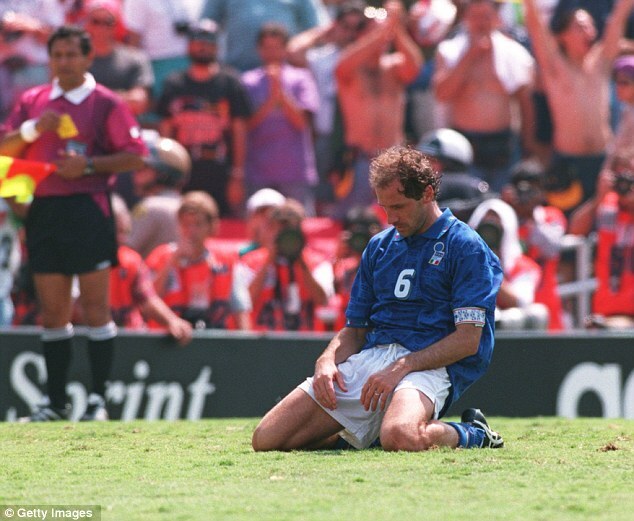 Somehow, Baresi returned to take the first Italian penalty. On the edge of the area, he stood trying to shake the tiredness from his legs, a tragic figure in waiting. With the last of his energy he ran towards the ball and kicked it with all his might. It sailed over the crossbar and into the sea of fans behind the goal. The captain fell to his knees, his hands thrown over his face to hide his pain. The Divine Ponytail of Baggio would go on to miss the decisive penalty, but this will always be Baresi’s story.